The building (originally a pub for local quarry workers) was built in the late 1800s, with the upper residence added in the 1930s. We've renovated the suite (2 bedrooms and 1.5 baths) with modern comforts while retaining much of the original charm. The interior design aesthetic is a blend of new and funky vintage finds, carefully chosen to be age and gender neutral. With a large bright kitchen, office/library, wet-bar and laundry room, this suite offers many more amenities than a comparably priced B&B or hotel room in Branford. It's a perfect space for family vacations, bridal parties, corporate and academic professionals who seek fully furnished, inclusive utilities and WiFi. 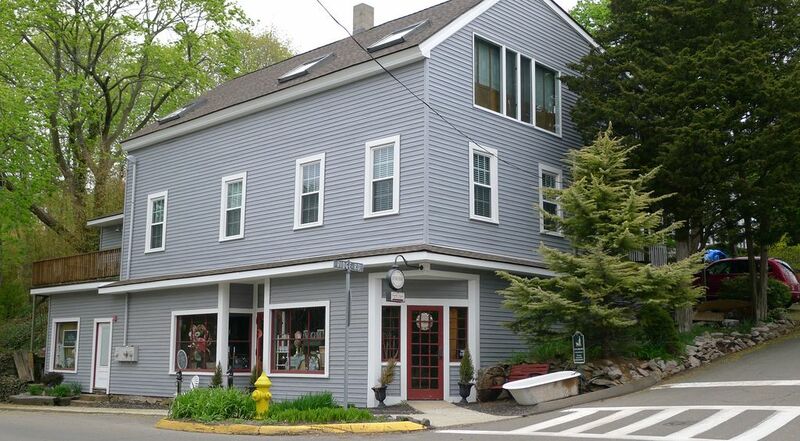 As Branford natives, we both are very familiar with the local area and enjoy renovation and preservation projects, and are happy to share our tales of what we learned about our building's history and character. Both fans of Big East Basketball, Claudio is a Providence Colleage Friar and Barbara is a Villanova Wildcat - so when it's March Madness, we are glued to the stats! After globetrotting in the yachting industry, Barbara's 15-year residence in Florida came to a halt when she relocated back to New England in 2008. As frequent vacation home renters themselves, we know what travelers expect when they arrive at their destination: clean comfort. The main bathroom has a separate toilet room and separate shower area with an open sink area (similar to many hotel styles). Besides the full size refrigerator in the kitchen, there is also a small one at the bar for beverages. If guests leave unopened groceries, we will leave in pantry/fridge, but guests should plan on bringing their desired food, spices and ingredients. We have an old cabinet style radio that works great! You are welcome to enjoy our library, but please leave it as found. If you do take a title home, let us know so we can replace it. Plenty of board games, cards, and a few jigsaw puzzles. Wood deck wraps around sunroom and off kitchen. Children should be supervised. Covered entry porch seats 4. The suite is on street level in the rear (where guests enter) and the kitchen door is only one step up, so it's not difficult to enter, but not ramped. Within walking distance there is a playground, public beach, library, nature trail, 2 small eateries, and marina. In the warm season, tour boats depart routinely from the docks for hour-long tours of the Thimble Islands. SECURITY: To promote safe conditions and support our property ownership rights and responsibilities, exterior entryway areas of the property are monitored by motion-activated lighting and cameras. Rest assured, we respect guest privacy during any stay on premises and will readily share information about the camera capabilities with booked guests. Beautiful home, with gorgeous attention to details in decorating! Tasteful decor and a peaceful stay. I feel many hours and thought went into the decor. Plenty of space and the rooms were larger then we expected. We loved having a laundry room. This apartment is adorable. Beautifully laid out and comfortable. Barbara outdid herself with design and decoration. We felt welcomed like we were visiting good friends. Thank you for making it a great vacation! Beautiful, warm and cozy apartment - perfect for a few days or a few months! The apartment was beautiful! All the amenities we expected and more. The decor, furniture and beds were soooo comfortable. I loved the location, cute little town but not far from the highway and within short driving distance to stores as well as New Haven. Our hostess was great and really hospitable. I have stayed in several VRBO properties and this is one of the best experiences I have ever had. Very large apartment, super nicely decorated with all the comfort of your home ! two minctes walking from the Stony Creek center ! Barbara is adorable and made us feel so comfortable right away ! We loved it !!!!! Beautifully appointed apartment stocked with all the touches to make your stay pleasant. 4 adults and a dog were quite comfortable. Close to trolley trail and small beach. It's only 4 miles to the center of Branford, a classic New England town with a quaint Main Street with many restaurants, shops and salons. Summer has many activities on the central green space (jazz concersts on Thursdays, fireworks, festivals). Guilford, is the neighboring town to the east with similar charm. Bishop's Orchards has pick-your-own crops so you can follow the season - and autumn is the culmination with pumpkin patch activities. Easy day trips to Hammonasset State Beach for nature lovers, or Mystic CT for a sense of history. The weekly rate reflects a 20% discount of the daily rate. The monthly rate reflects a 50% discount of the daily rate.